Here’s another healthy/healthful ingredient to slot into your culinary rotation. It's quinoa (pronounced keen-wah). This post's recipe takes the exotic flavours of Thai food and adds the health benefits of quinoa, instead of the usual side dish of rice. Lately I’ve been looking more carefully about what goes into my body, on the off chance that it will increase what I can get out of it. A sound concept, to be sure. Quinoa in your diet fits the bill perfectly for a healthier diet, especially if you have intolerance to gluten. 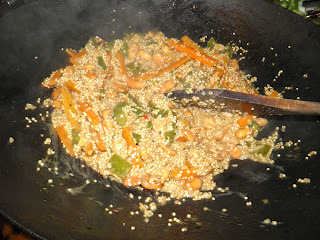 Quinoa is also an excellent choice for vegetarians as it has one of the highest protein levels of any plant-based food. Even though this is a vegetarian dish, you certainly won’t miss the “meat” aspect. I can guarantee that. 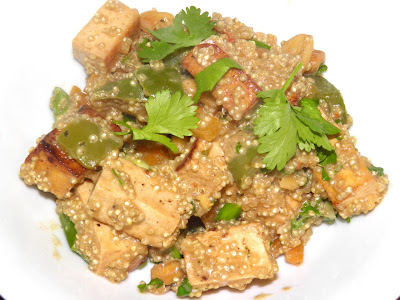 Quinoa is an ancient food originally grown by the Incas in Peru. It is high in protein, iron and magnesium and is gluten-free. Quinoa is easy to prepare and can be a great way to have a healthy diet even while eating gluten-free. It is almost as quick to prepare as rice and has a great, almost nutty flavour. But why did I put the word grain in quotes? Because it actually isn't a grain, even though we call it such. Read on. 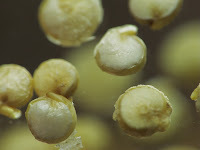 Quinoa, a species of goosefoot (Chenopodium), is a grain-like crop grown primarily for its edible seeds. It is a pseudocereal rather than a true cereal, or grain, as it is not a member of the grass family. 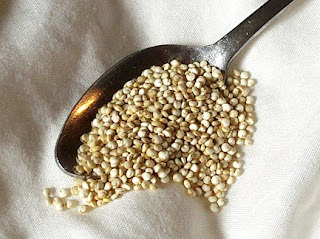 As a chenopod, quinoa is closely related to species such as beets, spinach, and tumbleweeds. In contemporary times, this crop has become highly appreciated for its nutritional value, as its protein content is very high (12%–18%). Unlike wheat or rice (which are low in lysine), and like oats, quinoa contains a balanced set of essential amino acids for humans, making it an unusually complete protein source among plant foods. It is a good source of dietary fibre and phosphorus and is high in magnesium and iron. Quinoa is gluten-free and considered easy to digest. There are two usual methods of cooking quinoa: one is to simmer, covered, in salted water (1 cup to 1.75 cups of water) for 30-35 minutes; the other is to pre-soak for 15 minutes and then cook in a 1 cup to 1.5 cups salted water. This is the "quick cook method" and shortens the cooking time to 15 minutes or so. It is recommended to rinse "bulk" (as opposed to packaged) quinoa for 3 minutes before cooking any method. This is because quinoa has natural chemicals, saponins, on the surface which makes them unpalatable to birds. Saponins can have a slightly laxative effect if left on the quinoa. The recipe seems to have a lot of ingredients but if you look carefully it’s not really. As with most Asian dishes, about half the time in in preparing ingredients before stir frying. Soak the quinoa in water for 15 minutes. Rinse, drain and set aside. Cube the tofu, place in a small bowl, sprinkle with the soy sauce and garlic powder and coat to marinade. Set aside for 10 minutes. Drain. has been absorbed. It's nearly dry. Mince the chilli, ginger and garlic. Peel and chop carrot into matchsticks. Chop the green pepper into 1/2 inch pieces. Chop the green onions into 1 inch lengths. Heat the oil in a wok. Brown the tofu on all sides for about 5 minutes. Remove from the pan. Stir fry ginger, garlic and peanuts for 2 minutes. Add the carrots, green pepper and broccoli and fry for 5 minutes more. Stir in the seasonings. Add the drained quinoa and stir until coated with spices. Add the coconut milk and fish sauce to the pan and grated lime rind, bring to a simmer and cook for 15 minutes or until almost all the liquid is gone. Add the tofu and green onions and heat through. Just before serving, add in the lime juice and mix well. Garnish with cilantro. I love Thai cuisine, I'll definitely give this a shot. Thanks.